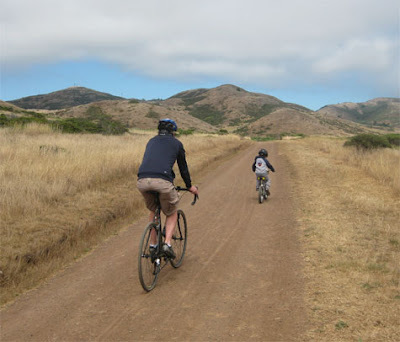 Taking a little ride with the boy in the Marin Headlands. Interesting and is this really San Fran...or am I confused? and that...The 'Idealists' have a plan that seems doomed to fail when 'people' run out of 'oil or space,' or 'food' though. Reminds me of a song by 'Alvin,' and "Ten Years After." Like when 'they' want to build a new mall or have a track, or road built leading you to some place important. Gee, the 'Middle East' needs something left to sell or trade. Just more than likely ignorant observations, since I really don't like to read. Sure did seem so like some are so despaired, or desperate for affection, that they think or long for sixes. Just boggled my bind for a moment. Nice to not care or worry so much about physical things anymore. Gosh, sure wish you'd got a chance to meet my husband in Utah and save a few drops of gasoline. Looks pretty 'dry' though in the Marin Headlands...so I wonder how long before it rains or quakes there? Those 'quakes' are more scary than the E-C-O=NOMY out there. Just interesting punctuation and plying keys. Pay absolutely no attention to me.